EVERY CLASS OFFERED HEREIN WHICH IS COVERED BY THE RULES AND SPECIFICATIONS OF THE CURRENT USEF RULE BOOK WILL BE CONDUCTED AND JUDGED IN ACCORDANCE THEREWITH. Online entry available at www.horseshowsonline.com. Daily adds/scratches are due in the show office by 4pm the daybefore the class, unless otherwise noted. All entry fees are stated under each class description. All entries must be secured with an open check or signed credit cardauthorization for back numbers to be released from the show office. Any check returned by the bank for any reason, or any credit card that is disputed or declined will be charged a $50 fee or 10% of the amount of the payment, whichever is greater. All declined paymentsmust be replaced by certified funds. No exhibitor will be permitted to participate at the show while aprior indebtedness is outstanding. Exhibitors must check out their account each week. Any exhibitorthat fails to check themselves out, will be invoiced an additional $60by the show. No exhibitor with an outstanding bill from the previousweek will be permitted to pick up numbers. Prize money will be credited to show bills and paid within 30 days following the conclusion of the show via check. Prize money and refunds will be made payable to the owner of the horse unlessotherwise indicated in writing to the show office. A valid SSN or Tax ID information is required for all payments. A FORM W9 is required to be presented for all exhibitors. Foreign exhibitors are advised that the US Internal Revenue Service requires sporting events to withhold 30% of the prize money won in the United States. Foreign exhibitors should apply for a US Social Security number and be asked to complete FORM W8-BEN prior to any prize money being paid. 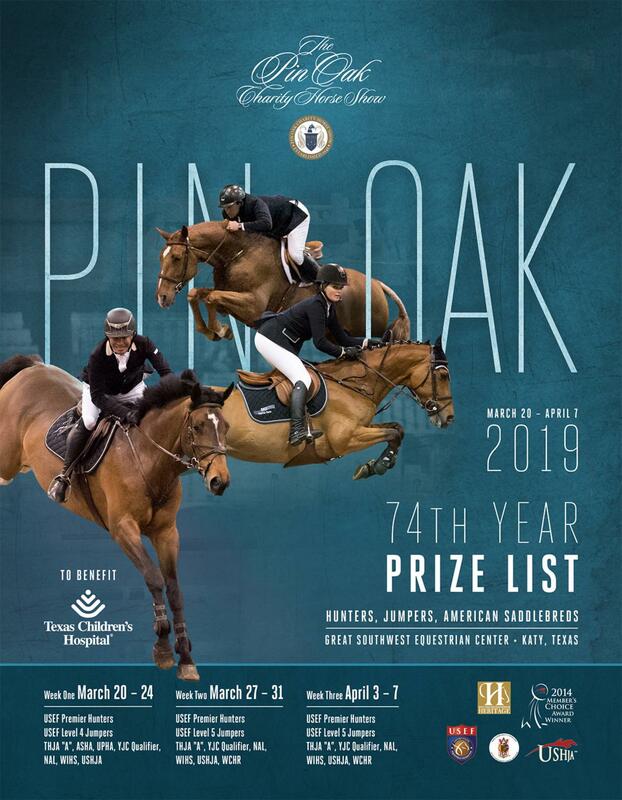 Stalls for Pin Oak Charity Horse shows will be available for $250. Stalls are permanent or temporary under tent, 12’ x 12’ and 10’ x 10’ with doors. All horses must show out of a stall. Exception, breeding/in hand horses may purchase a single night stall for $100. Horses are not permitted to share stalls, unless all horses are owned by members of the same family. Management may limit tack stalls if necessary. Exhibitors are responsible for any damage made to a stall. Charges for damage to any stall will be billed to the exhibitor by GSEC. Damage to any stall panel will incur a $100 fee per panel. Dismantling or altering of stalls will incur a $50 fee per panel for re-installment by GSEC. 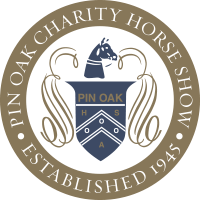 Pin Oak Charity Horse Show is not responsible for any additional housing or security needs for stallions or any other special needs horses. The owners are responsible for any additional modifications and to supply the materials and labor needed to secure their stalls for their horses safety and the horses around them. Stall requests must be accompanied by stall fees or an open check/ credit card authorization. form. Stalls are assigned on a first come basis. Shavings will be available for purchase on grounds from 8am – 5pm daily. No outside shavings or straw are permitted without permission in advance. Any exhibitor found bringing in outside shavings or straw will be fined $100 per stall. All feed and bedding ordered will be billed through the horse show office. Trainers wishing to do “splits” must provide that information to the show office by the posted weekly deadline. Any splits submitted after the weekly deadline, may be done with an additional split fee of $30. No splits will be done on check out day, no exceptions! Any horse on the ground for any showing week must be entered in classes or pay the $150 non showing fee. An entry blank must be on file for EVERY horse on the grounds and pay the non-refundable office fee. No stall fees will be refunded after the close of entries. Entry fees, less a $50 scratch fee will be refunded once a certificate of illness or injury to horse or rider is presented to the show office before the start of each show. It is the responsibility of each exhibitor to officially scratch entries in any classes they do not plan to participate in writing in the show office. Once the show has started, horses which are not shown in classes that they have entered forfeit their entry fees, except if a horse is injured or becomes ill prior to the start of the class(es) entered. This must be accompanied by a certificate from the official show veterinarian. Current USEF rules and regulations regarding D & M will be enforced.Sharps and medical waste must be disposed of in sharps containersplaced around the barns. All competitors are asked to comply with the USEF Testing Veterinarians in a courteous and efficient manner.Please note that sharps containers MUST be used as provided orpenalties will occur. All showing horses will be invoiced the USEF D & M and USEF Fee of $23. Jumper Proper Attire is required for all classes in the Main Arena unless otherwise noted. Jumper Formal Attire is required for all Jumper Class offering $10,000 or more. A rotating random jump order will be used for all classes in the Main Arena. All classes offering $5,000 or more will have an order drawnby the steward. Courses will be posted a minimum of 30 minutes prior to the startof each class. At management’s discretion, a dotted line may be put into effect to restrict the size of the courtesy circle in hunter classes. Footing is a priority; rings may be closed to schooling during inclement weather and/or for maintenance at any time during the show at management’s discretion. Life, senior active and junior active members shall be eligible to participate in all classes at Regular Competitions, Eventing Competitions at the Preliminary Level or above and Combined Driving Competitions at the Advanced Level, Dressage, Reining and Vaulting Competitions and Endurance Rides. A nonmember may participate as a handler, rider, driver, owner, lessee, agent, coach or trainer at Regular Competitions, Eventing Competitions, Dressage Competitions, Reining Competitions and Combined Driving Competitions upon payment of a $45 Show Pass fee. Participants in the following classes are exempted from the Requirements of this rule: 1) leadline; 2) exhibitions; 3) games and races; 4) classes for 4-H members; 5) walk trot and academy classes (academy classes are classes limited to horses used regularly in a lesson program); 6) USDF introductory level tests, pas de deux and quadrille classes; 7) NRHA Endorsed Reining Competitions. 8) Opportunity classes, 9) citizens of other nations who have proof, in English, of current membership in good standing of their own National Federation, 10) USEA beginner novice division; and 11) assistant handlers in Dressage Sport Horse Breeding classes. By entering a Federation-licensed Competition and signing this entry blank as the Owner, Lessee, Trainer, Manager, Agent, Coach, Driver, Rider, Handler, Vaulter or Longeur and on behalf of myself and my principals, representatives, employees and agents, I agree that I am subject to the Bylaws and Rules of The United States Equestrian Federation, Inc. (the “Federation”) and the local rules of Pennsylvania National Horse Show I agree to be bound by the Bylaws and Rules of the Federation and of the competition. I will accept as final the decision of the Hearing Committee on any question arising under the Rules, and agree to release and hold harm¬less the competition, the Federation, their officials, directors and employees for any action taken under the Rules. I represent that I am eligible to enter and/or participate under the Rules, and every horse I am entering is eligible as entered. I also agree that as a condition of and in consideration of acceptance of entry, the Federation and/or the Competition may use or assign photographs, videos, audios, cable – casts, broadcasts, internet, film, new media or other likenesses of me and my horse taken during the course of the competition for the promotion, coverage or benefit of the competition, sport, or the Federation. Those likenesses shall not be used to advertise a product and they may not be used in such a way as to jeopardize amateur status. I hereby expressly and irrevocably waive and release any rights in connection with such use, including any claim to compensation, invasion of privacy, right of publicity, or to misappropriation. The construction and application of Federation rules are governed by the laws of the State of New York, and any action instituted against the Federation must be filed in New York State. See GR908.4. Minors who do not have a valid driver’s license which allows them to operate a motorized vehicle in the state in which they reside will not be permitted to operate a motorized vehicle of any kind, including, but not limited to, golf carts, motorcycles, scooters, or farm utility vehicles, on the competition grounds of licensed competitions. Minors who have a valid temporary license may operate the above described motorized vehicles as long as they are accompanied by an adult with a valid driver’s license. The parent(s), legal guardian(s), or individual who signs the entry blank as a parent or guardian of a minor operating a motorized vehicle in violation of this rule are solely responsible for any damages, claims, losses or actions resulting from that operation. Violations of this rule will be cause for sanctions against the parent(s), guardian(s) and/or trainer(s) who are responsible for the child committing the offense. Penalties may include exclusion of the child, parent(s), guardian(s), and/or trainer(s) from the competition grounds for the remainder of the competition and charges being filed against any of the above individuals in accordance with Chapter 6. Wheelchairs and other mobility assistance devices for individuals with disabilities are exempt from this rule. Under Texas Law (Chapter 87, Civil, Practice and Remedies Code), a farm animal professional is not liable for an injury to or the death of a participant in farm animal activities resulting from the inherent risks of farm animal activities. Please continually check www.gswec.com and www.pinoak.org for any additional equine health requirements. Texas law requires that each horse has a negative EIA certificate dates within in one year. A negative EIA (Coggins Test) must accompany each horse when it enters the grounds. Horses will not be permitted on the grounds without documentation. All horses on the grounds must comply with and provide proof of vaccinations per USEF GR845. Horses will not be permitted on the grounds without documentation. All out of state horses must have a current health certificate to be presented upon arrival on the show grounds. Submission of entry to this show constitutes an agreement to he following: Exhibitor agrees to indemnify and hold harmless Great Southwest Equestrian Center LP, The Pin Oak Charity Horse Show, Oliver Kennedy, Kent Moeller or their officers, respective directors, agents, show management, employees or representatives against any claims, demands, costs and expenses, including reasonable attorney fees for the defense thereof, arising from the conduct or management of Exhibitor’s business or its conditions of this agreement, or contractors, agents, premises. In case of any action or proceeding brought against Great Southwest Equestrian Center LP, The Pin Oak Charity Horse Show, Oliver Kennedy, Val Garza, Kent Moeller, or their officers, respective directors, agents, show management, employees or representatives by reason of any such claim. 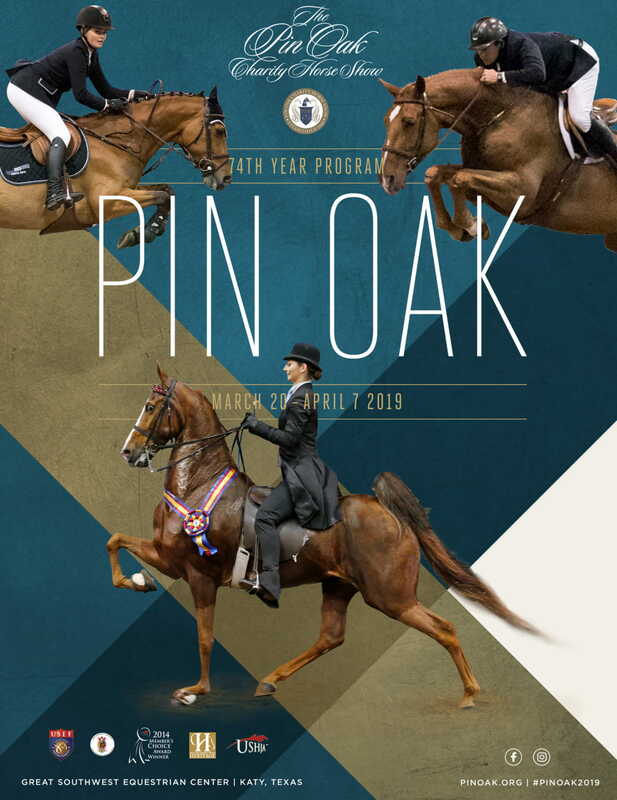 Exhibitor, upon notice, covenants to defend such action or proceeding by counsel acceptable to Great Southwest Equestrian Center LP or The Pin Oak Charity Horse Show. Exhibitor is responsible for his/her own property, and the Great Southwest Equestrian Center LP is not responsible for accidents, fire or theft. Barn areas must be kept free of motor vehicles. Roping off or blocking of aisles in barn areas is prohibited. Designated fire lanes must be kept clear. Vehicles parked in unauthorized areas will be towed and subject to recovery of the towing fee from the owner. All extension cords must be Underwriters Laboratory approved for outdoor use. Heavy extension cords are recommended. These rules are for the protection of the exhibitor, his livestock, fellow exhibitors and the public. The use of electric, open flame or space heaters is prohibited. Cooking or any heat/flame food preparation is not allowed in the barn area. There will be limited schooling at times to be posted in Show Office. No Schooling Fee. Camper spaces are available for $300 per week in the old section; $350 per week in the Premier section. One pump out per week is included. Camper pump outs will be done on Saturday of each week. Anyone needing additional pump outs WILL incur additional charges. To reserve your RV space a form of payment must be provided in advance. Please see RV Camper Registration Form included in this prize list or contact the Pin Oak Charity Horse Show office. A late fee of $50 will be assessed for any reservation that is submitted after 3/5/19. Priority will be given to sponsors/exhibitors staying all three weeks. Sponsors receive priority if received by 2/1/19. RV spaces sell out every year. Online reservations WILL NOT be accepted after 2/25/19. All pets on the Show Grounds must be on leashes at ALL times and must not be tied in the aisles in the barns. This will be enforced. Your cooperation will be appreciated for the benefit of exhibitors and spectators. Pursuant to USEF GR301. A $100 Loose Pet Fee (donated to a local charity) will be collected for all animals found without a leash. No points will be counted toward THJA annual awards until membership dues have been paid and horses have been recorded with THJA. A $3 THJA Education fee will be collected for every horse showing in a THJA Recognized class. THJA members shall be eligible to participate in all classes at competitions recognized by THJA. A person/horse may register with the THJA at a recognized horse show as long as the application(s) and payment accompanies the official horse show results. Registrations may also be completed online with a credit card at the THJA web site before the end of the show. All riders and trainers, in addition to owners of THJA registered horses must be members of THJA for the points to count. PIN OAK CHARITY HORSE SHOW (ONE) (TWO) AND (THREE) are operated in accordance with current rules of the Texas Hunter & Jumper Association by which it is recognized and rated : “A” in High Performance, Performance Hunter, High Performance Conformation Hunter, Green Conformation Hunter, Green 3’, 3’3”, 3’6” & 3’9” Hunter, Amateur Owner, Green Pony, Pony, Children’s Pony, Junior, Children’s and Adult Amateur Hunter, Modified Children’s and Modified Adult Hunters and Jr/AO Jumper, Children’s Jumper, Adult Amateur Jumper. Points for placings in Hunter Breeding, Junior, Pony, Children or Adult Equitation classes will be credited in accordance with the rules of the THJA. All protests and questions not covered by these rules shall be decided and interpreted by the Competition Committee, whose decision shall be final. Disputes should be presented to the Show Manager prior to filing a formal protest under the provisions of USEF Chapter VI. A protest must be in writing and may be made to the Competition Committee by and exhibitor, agent, trainer or parent of a Jr. Exhibitor for any violation of USEF Rules. All hunter classes will receive a trophy and eight ribbons unlessotherwise noted. All equitation classes will received a trophy andsix ribbons unless otherwise noted. All jumper classes will receive a trophy and six ribbons unless otherwise noted. Each hunter andjumper section will receive a champion and reserve award based onpoints unless otherwise noted. Ties in jumper classes will be jumped off for first place only. Ties for all other places will be determined by the fastest time in the firstround among those with an equal number of faults. Hunter Championship will be rendered per USEF Rules. Jumper Championships will be rendered using the Bonus Point system. Bonus points will be applied to one class per section (see section for specific class). Ties in Jumper Championships will remain tied. A unique cumulative awards program open to Juniors, Amateurs & Professionals in all divisions for the 2017 competition year starting on December 1. 100% of proceeds benefit horse welfare. Where they go next matters! No number will be release until proper credentials and all signatures are in order. All exhibitors must provide proof of current memberships and are encouraged to send copies with their entryblank. Anyone not presenting current membership credentials(USEF/USHJA) will be charged a show pass fee of $45 per person,per organization. All horses must be recorded in accordance to therules of USEF, ASHA, AHHS, ARHPA and USHJA. Measurement cards must be presented for all classes restricted by the size of the horse/pony. Effective June 1, 1985, a copy of American Saddlebred registration papers OR a copy of the registration papers with a certificate ofEligibility to Show issued by the USEF must be presented to thehorse show office before numbers may be released. All entry blanks must be signed in provided spaces by Owner, Trainer, Rider, Driver, Coach or Handler. Anyone under the USEF Show age of 18 must have the signature of a parent or guardian on the entry blank. It is the responsibility of the person making the entry to execute properly and complete all necessary information pertaining to each entry made in accordance with the rules of USEF.